Having just celebrated the 10th Anniversary of the Retired Stress Analysts group in May 2012, it seems appropriate to announce their existence to all MARS STAR readers. 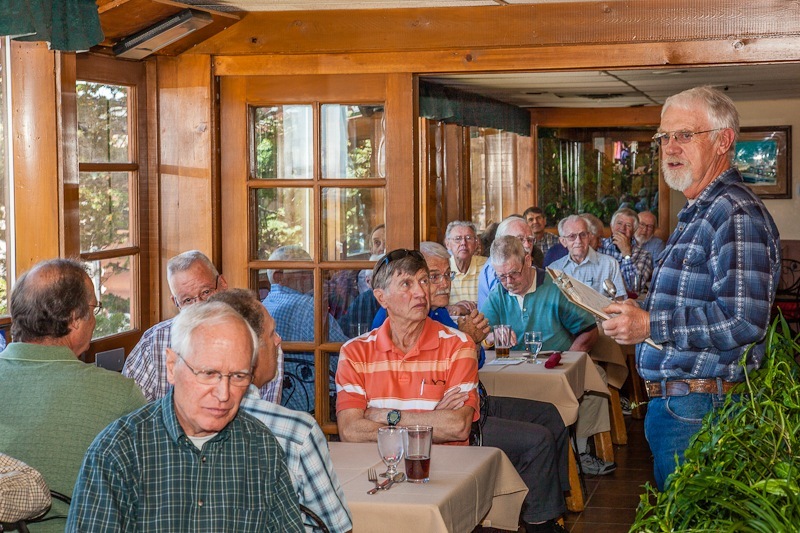 The Ten-Year celebration luncheon was held at the El Rancho Restaurant north of Evergreen with 35 members and guests in attendance. A slideshow program featured history and highlights of the organization as well as a review of all the luncheon locations and many programs conducted by the group. A wrap-up paid respects to all deceased members from the past 10 years, then looked at possible future directions for the group. The 56-member group is composed of all retirees from Martin Marietta, Lockheed Martin, and now ULA, that were ever employed in their aerospace career as Stress Analysts. They started meeting for Quarterly luncheons around the Metro Denver area in 2002 and have now firmed up a schedule that includes a February Luncheon in Littleton, May in Evergreen, August in Dillon, and November in Castle Rock. Following each lunch there is a presentation by one of the members which has always been something unique and interesting that the members are doing. These programs have included foreign travel (Europe, South America, Australia), volunteer activities, athletic adventures (Mountaineering, Cycling, SCUBA diving), military service in WWII, hobbies and craft activities, and even engineering accomplishments from their working days. Most presenters use the group’s digital projection A/V equipment with photos, videos or PowerPoint slides. Early on in 2002, a web site/email list was created <http://groups.yahoo.com/group/retMMCstress> to make for smooth communication among the membership. Digital photos from each luncheon are posted on the site, as well as membership rosters with complete contact information. It's really been neat to renew friendships with many of the co-workers that likely would not be seen very often except for these regular luncheons. The Retired Stress Group maintains 4 different rosters including: active members, deceased members, a list of potential members they have been unable to contact, and finally a list of employees that we expect may soon be retiring. We also invite members to bring guests from other departments, and once each year we invite all Mechanical Engineering Department retirees that are able to be contacted. They always looking for the few elusive retired stress analysts that are not current members of the group, so if you qualify please contact Tom Nelson at <tom10@wispertel.net>, or Tom Brown at <t.g.brown@comcast.net>.